Charles Allen Hinshaw4 [Charlie Allen Hinshaw1,8,9]. 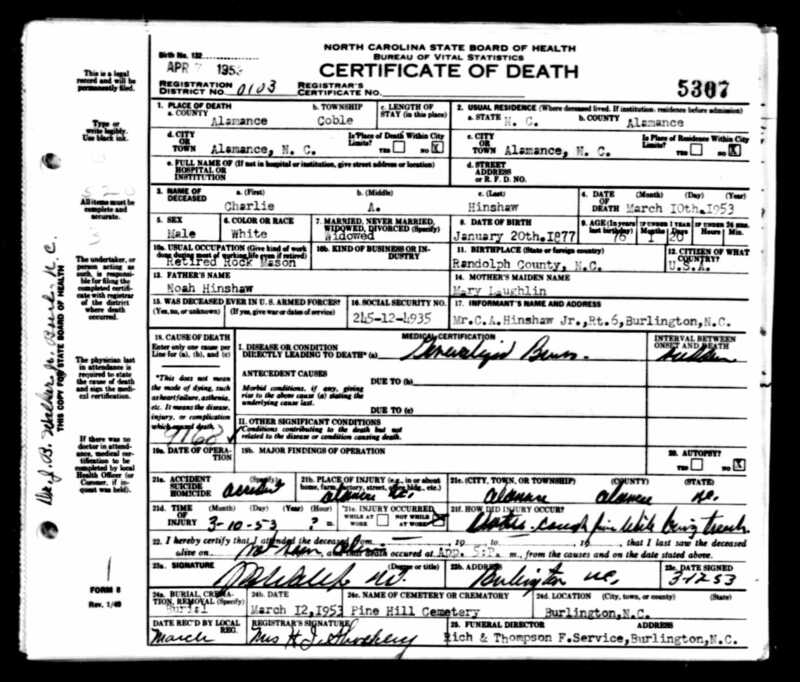 Hinshaw, Charles, head-of-household, age 23, born Jan 1877 in North Carolina; parents born in North Carolina; married 1 year; occupation: cotton weaver; rented home. Hinshaw, Dora, wife, age 23, born Jan 1877 in North Carolina; parents born in North Carolina; married 1 year; no children. 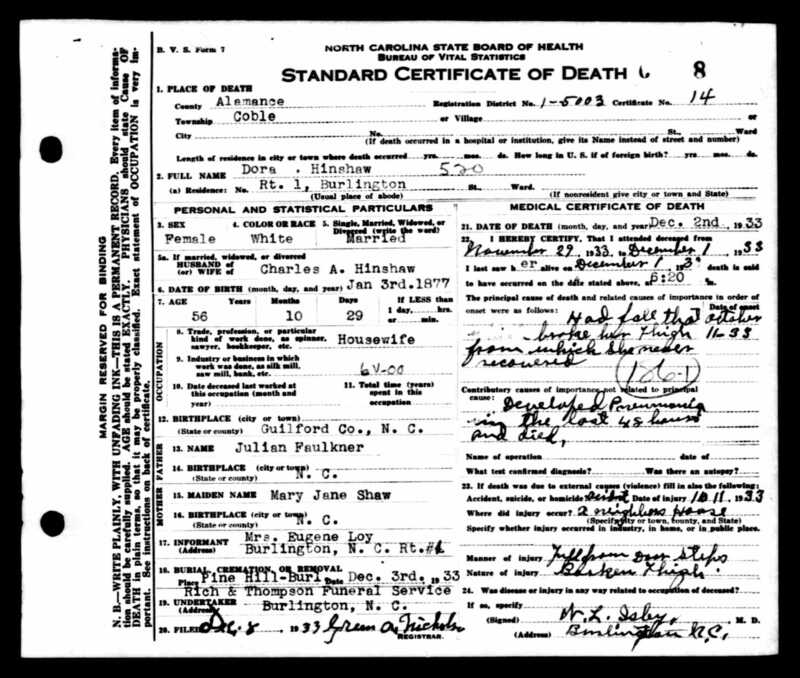 Hinshaw, Charles E, head-of-household, age 33, born in North Carolina; parents born in North Carolina; married 11 years; occupation: carpenter, house building (unemployed 7 weeks during 1909); owned home (free). Hinshaw, Dora F, wife, age 33, born in North Carolina; parents born in North Carolina; married 11 years; 5 children, 3 living. Hinshaw, Clara, daughter, age 5, born in North Carolina; parents born in North Carolina. Hinshaw, Mary S, daughter, age 2, born in North Carolina; parents born in North Carolina. Hinshaw, Ollie V, daughter, age 10 months, born in North Carolina; parents born in North Carolina. Hinshaw, Charles A., head-of-household, age 42, born in North Carolina; parents born in United States; rented home; occupation: house contractor, dwelling houses. Hinshaw, Dora I, wife, age 42, born in North Carolina; parents born in North Carolina. Hinshaw, Mary S, daughter, age 12, born in North Carolina; parents born in North Carolina; attended school. Hinshaw, Ollie V, daughter, age 10, born in North Carolina; parents born in North Carolina; attended school. Hinshaw, Charles A. Jr., son, age 3 years 7 months, born in North Carolina; parents born in North Carolina. Hinshaw, Charlie A., head-of-household, age 52, born in North Carolina; parents born in North Carolina; first married at age 21; owned home; no radio in home; occupation: carpenter, houses; not a war veteran. Hinshaw, Dora I, wife, age 52, born in North Carolina; parents born in North Carolina; first married at age 21. Hinshaw, Ollie, daughter, age 20, born in North Carolina; parents born in North Carolina; occupation: looper, hosiery mill. Hinshaw, Charlie A. Jr., son, age 13, born in North Carolina; parents born in North Carolina; attended school. Hinshaw, Charlie A, head-of-household, age 63, born in North Carolina; completed 7th grade; on Apr 1 1935 was living in rural Alamance County, North Carolina; widower; owned home ($250 value); occupation: brick mason, building construction; worked 18 weeks in 1939; $360 wages in 1939. 1910 census, Burlington, Alamance County, North Carolina; roll T624-1095, ED 16, page 26A, line #2, dwelling #458, family #459. Obituary of Mary S. Hinshaw. 1920 census, Burlington, Alamance County, North Carolina; roll T625-1282, ED 18, page 7A, line #8, dwelling #124, family #125. 1930 census, Coble Township, Alamance County, North Carolina; roll T626-1671, ED 2, page 11B, line #56, dwelling #199, family #200. 1900 census, Burlington, Alamance County, North Carolina; roll T623-1180, ED 13, page 27B, line #67, dwelling #508, family #508. 1940 census, Coble Township, Alamance County, North Carolina; roll T627-2868, ED 1-2, page 11A, line #19, household #196.